What is it? Maya and Grom sitting in a tree. K.I.L.L.I.N.G. Everything. You always knew, given the chance, your group we do way better against the Overlord if you just ran all the characters yourself. Now's your chance to prove it. Call it a bad run, call it a changing preference, some ineffable whisper on the winds of what should and should not be. However I choose to describe this transformation in gaming habits, the crux of it is that I haven’t enjoyed a good dungeon crawl in quite some time. Made all the more concerning given the role that Descent played in leading me into this hobby, and I can’t quite put my finger on what exactly has changed. I’m more likely to pass up blasting away demon hordes for the rather more sedentary voyage of Marco Polo, but is that indicative of a change in tastes, or a lack of innovation? I loved last year’s sleeper hit Adrenaline, so it’s absolutely not that I lack the capacity or engagement – is it perhaps an issue of pacing? Or one vs many? That analysis is a feature for another time, the point of today is to tell you that to my great relief I still do love dungeon crawlers. And I have Arcadia Quest to thank for that reminder. Guild board with heroes and item slots. Slingshot and Rusty Blade? Why not. And it’s strange, I really didn’t think that would be the one to do it. If anything, it’s a strong narrative element that tends to hook me into dungeon crawlers in the first place and as witty as Arcadia’s setting is, an engaging narrative it is not. The art style is also the other major polarising factor – personally I find the aesthetic immensely charming and perfect for the style of game this is, but I can certainly empathise with those who find that stylistic approach just a little off-putting. 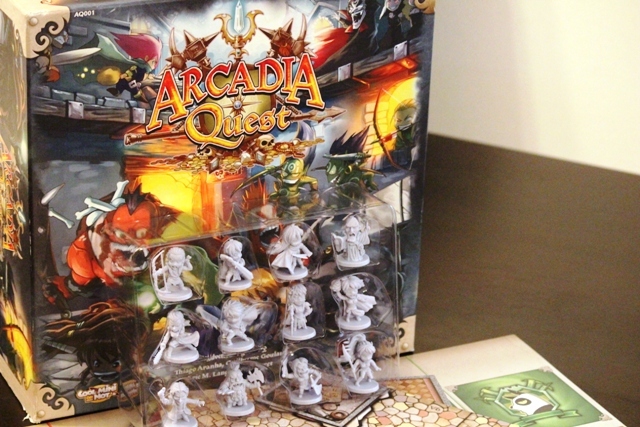 What exactly is Arcadia Quest? Well, you know how you’re running a dungeon with your guild in WoW or Guild Wars, and there’s always that one Leeroy Jenkins whose presence you wish you didn’t have to tolerate? Imagine if you could reap the benefits of running your own guild, but without the backseat driving? 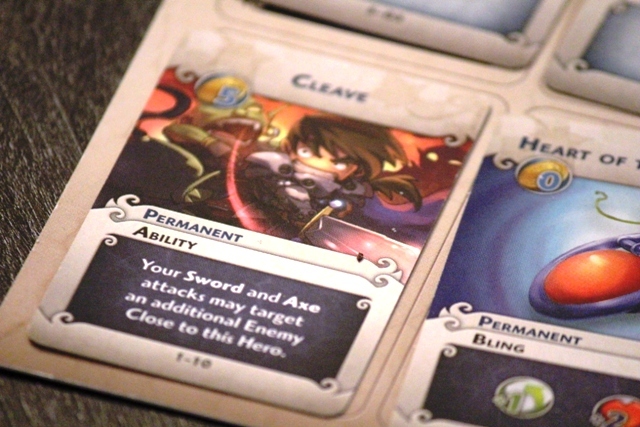 Yeah, that’s Arcadia Quest in a nutshell. Oh, and if there happens to be a Leeroy Jenkins across the table, you can exact your revenge too. Spike might only have two health, but he’s not going down without a fight. The first major plus is how easy the game is to get into. Choose three heroes, equip them with starter items and point them in the right direction – no wrestling with rules around fatigue and stat checks, no unfortunate player who ends up being the designated healer of the group and secretly just wishes the whole thing would be over, no juggling status tokens or trying to figure out the difference between dazed and stunned. The rulebook is comprehensive at 36 pages, but that’s mainly due to thorough explanations of the various concepts as opposed to dozens of pages of various terms to acclimate to. You’ll only ever be doing one of two things when you turn comes around – activating one of your heroes or resting your guild. Activation is a simple enough move and attack, or attack and move. But move where, and attack who? Ah, now we get to the core of what makes Arcadia so deliciously enjoyable. Whether you choose to play through the campaign, or simply jump into a once off game, each scenario includes a PvP objective and a PvE objective. Completing an objective allows you to place one of your Guild tokens on that objective, but a game can only ever end by players completing three, with at least one of each. Cute? Yes. But just as deadly. PvP generally just requires you killing off a member of another guild, but you only get to place one token per opposing guild. This makes ganging up or attacking the same opponent relatively pointless – not unlike Adrenaline, it insures that Death tends to possess an equitable outlook on those whom he calls upon. That said, you do get gold every time you off another hero, so even if you’ve killed a member of the Eagle guild, if you happen to pass poor Grom, rapidly bleeding out…well, isn’t it but a mercy to make his passing quicker? PvE offers greater variation, anything from killing a particularly nasty boss monster to reaching a certain location, and completion of these is not only a means to progress to the next scenario, but these quests also offer rewards, including for the first player to complete one. And rewards are often in limited supply, so tarry at your own risk. In the realm of Arcadia, death tends to be more of an inconvenience than a permanent disability. A lethal encounter with a pointy end takes that hero out of the game until you use your Rest action, upon which they will respawn all shiny and chrome. As in reality though, this Death also has a sense of humour. Die, and you need to draw from the Death Curse deck, which will saddle your hero with anything from a Nosebleed to Amnesia, which prevents you from using that hero’s special ability. You’ll also collect a Death Token for your troubles, but these only impact the campaign and essentially start you off the next scenario with a nasty curse. 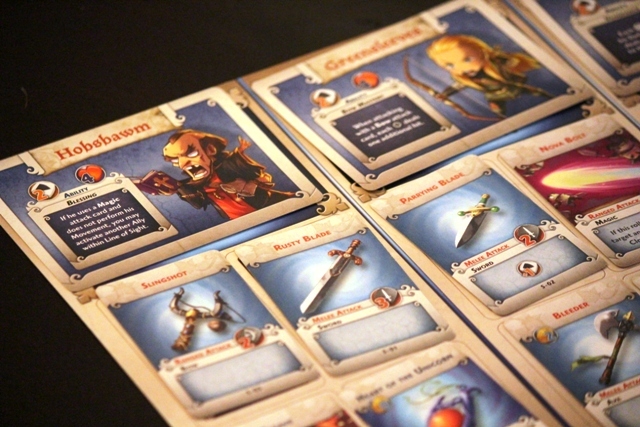 Each hero has four slots for weapons, spells and abilities and these will be populated with cards that grow in power as the campaign progresses. 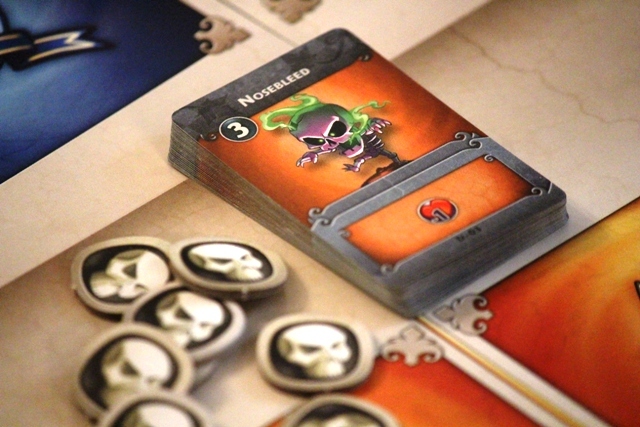 Quite simply, use a card to attack or for the printed ability and that card is tapped until a Rest phase – have weapons fitted to all four slots and you’ll be able to attack four times before you need to rest. Let’s talk about Resting in dungeon crawlers for a moment, because hoo boy nothing grinds a game’s momentum down to a dull edge more than that. I understand why it exists and that you can’t have heroes running around firing off all manner of powerful ability unchecked but let’s be honest, no one really enjoys spending a turn doing well, nothing. A nosebleed temporarily drops your health by one. And stains your shirt. Arcadia Quest doesn’t avoid this entirely, Resting actually feels like a powerful ability in itself. Not only are you able to resurrect dead heroes, but you can also unexhaust all of your used weapons and abilities and even better, you can reallocate cards between all of your heroes. And the timing of taking this Rest action becomes a deliberate strategy. Do you run all three heroes ragged, resting only when you must? Do you rest as frequently as possible so you can spam a particularly powerful ability? Have one last objective to complete but you really wish your strongest brawler had your ranged heroes bow? AQ is geared toward you getting into the thick of battle and sowing destruction with every step as often as possible. The game positively demands that the streets run red with the blood of your enemies. And given the number of monsters waiting around every corner, blood will indeed flow. I won’t delve into how the monsters work aside from pointing out that players control movement and roll attack dice and that monsters basically either react directly to an attack, or engage in an attack of opportunity (for Xcom players think Overwatch – if you move past a monster without attacking). 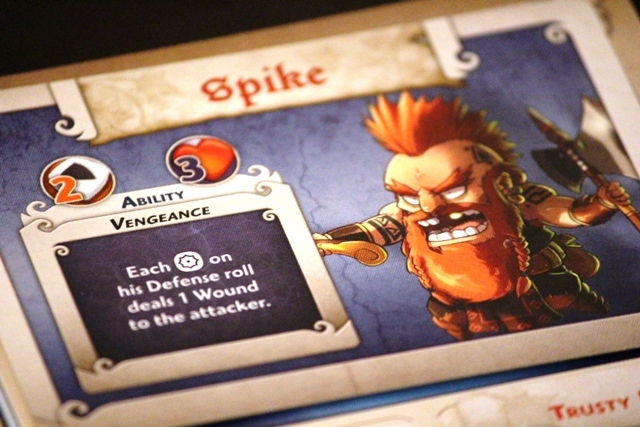 Combat is quick and brutal – roll your attack die, roll defensive die, apply results. Match monsters health, and victory is yours, although not without one last retaliatory attack. Monsters can be overkilled though, in which case no last hurrahs. And attack dice can explode. Having been on the receiving end, I can tell you that even your most resilient hero can be brought to his knees in one blow. How much does this upgrade cost? The lives of your enemies, that’s what. AQ’s pace is seductive – turns are quick, whether you’re playing a campaign or a single scenario the action never drags or overstays its welcome. 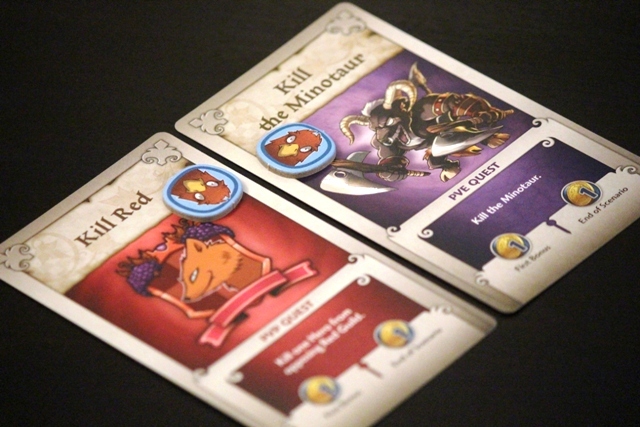 Controlling three heroes presents a number of interesting strategies at any given time without making your decisions overly complex, and unlike games such as Dead of Winter which also sees you controlling more than one character, you’ll come to value every member of your guild. And while on the face of it certain heroes may seem more immediately useful or be in possession of ‘cooler’ powers, scenarios are varied enough so that each hero gets their chance to shine. Balance is often a point of contention in games of this nature, whether it’s the one vs many of Descent and the endless debate as to whether the Overlord is at an advantage or not, or the question as to whether certain classes become overpowered at higher levels. And to be fair, after my first few rounds of AQ I did start to ponder similar questions. You may well find that certain players seem to finish a session with twice as much gold as you, and since that gold can be spent on upgrades between scenarios, you may be concerned that one player will essentially buy his way to victory. Thankfully though, this is not the case. Many of the games best weapons/abilities are low cost and accessible to all players, upgrades are limited to three cards per phase, and most importantly just a few deaths can slash the Achilles heel of even the most powerful of heroes. I’ve spent plenty of time comparing AQ to games like Descent, but I would never view it as a replacement. If anything this is more a skirmish game than a dungeon crawl and while the simplified ruleset of AQ lends it wider appeal, it isn’t strictly an RPG. Descent and Imperial Assault and Shadow of Brimstone are geared toward offering an unparalleled immersive experience, it’s just that too often this comes at the cost of engagement. And of course sometimes you want to be Gimli at the Council of Elrond, offering Frodo your axe rather than embedding it in his skull. AQ is a nasty game, smearing blood all over the notions of heroism and honour. If you cannot find solace in the misfortune of your friends, look elsewhere. Where there is no honour, there is greed, and so I must issue a stern warning to all who may find affection for AQ growing within their hearts – expansions may well be the death of you. Or your wallet. From big box expansions such as Beyond the Grave and the standalone iterations that can still be integrated such as Inferno and Masmorra, to the dozens and dozens of additional heroes, CMON will pillage your bank account without shame. But should you reveal a rare strength of character and manage to resist the allure of CMON’s horn of plenty, rest assured that there is more than enough in this box to provide tens of hours of unadulterated fun. 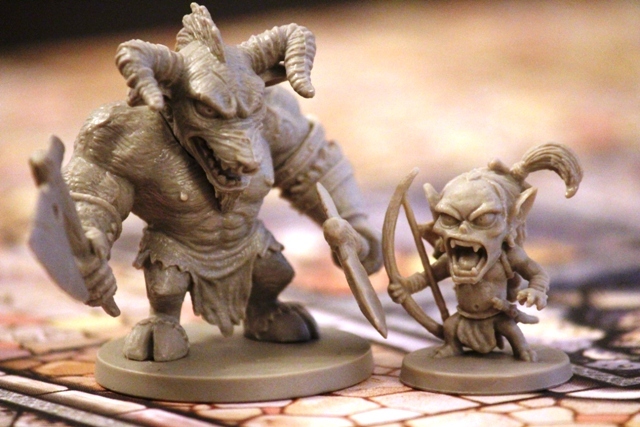 Everything about Arcadia Quest is both a welcome breath of fresh air, and also a nostalgia-fueled reminder of what made those Quake and Unreal Lan weekends such potently distilled fun. No AI will ever be as crafty as your friends. 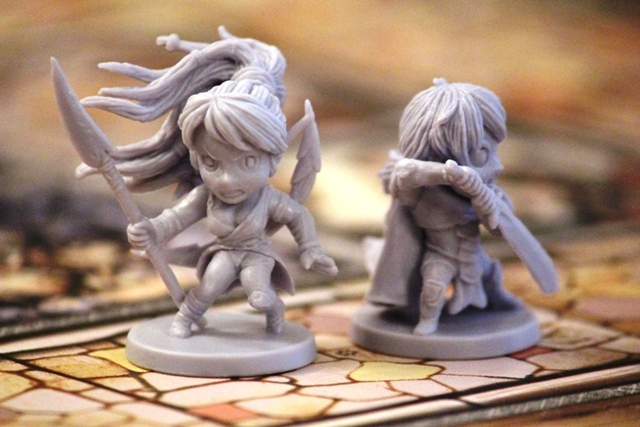 Arcadia Quest is a one-two punch of gaming goodness and has as its highest priority the desire to see you wielding swords and firing off spells as frequently as possible. At dozens of targets. Your friends included. It may not offer the complexity and depth of its more traditional cousins, but the toolset you're given offers plenty of tactical nous and a variety of scenarios to flex your cunning. Come for the pretty, stay for a damned good time.